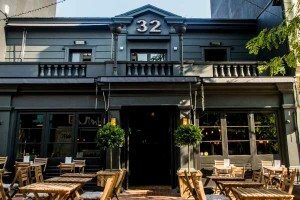 No.32 is located on Dukes Street right in the heart of the city centre, in fact it’s about as central as can be. On the cusp of the The Lanes, 30 seconds from Churchill Square and a just few minutes walk away from the North Laine area. 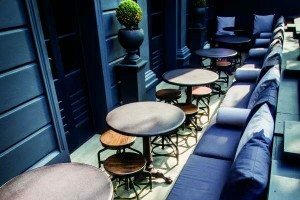 Formerly known as Havana’s the transition to its present day guise took place in August of last year, the same time that head chef Matt Hudson Ward took over in the kitchen. The spacious and impressive interior remains; there’s an Americana inspired vibe at work, cross referenced with a slice of Spain and a dollop of English charm. Yet despite the size, it’s warm and not the least bit intimidating or cavernous, in fact quite the opposite. Come the weekend, diners can take advantage of late night drinks and the chance to shake a tail feather or two. Tonight though is all about the gastronomy and recent launch of their spring menu. A genial welcome from manager Rafael and we’re swiftly seated, perusing the menu over a refreshing Viru beer from Estonia (followed by a Flying Dog pale ale). From the Bites section, we opted to begin with deep fried, crisp pork croquettes (£8) served with a stellar mushroom tartar; flush with fresh parsley, mustard seeds and bolstered by a zingy acidity. The shredded pork inside, tender and coated in a mellow cheese sauce. There followed (thanks chef), a dish of pickled vegetables and a fish platter. 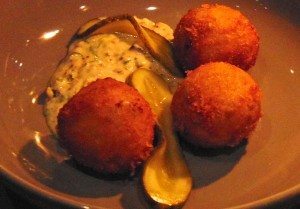 The croquettes were good, while these two dishes raised the bar. The pickling well judged, with the flavour of the carrots, cauliflower and fennel uncompromised and their texture intact. The toasted almond dip housed a lightly charred nuttiness and was the perfect foil to the tart pickling, particularly the fennel. Satisfying and uncluttered eating. 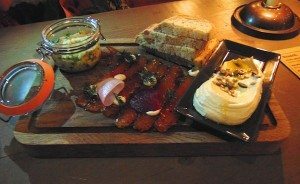 The fish platter (there are tempura and meat platters too, from £11 to £15) was large enough to share but one person could happily polish off the whole lot; it would make for a nice lunch. The lightly warmed potted mackerel was well seasoned with a mild citrus acidity running through. The cured strips of salmon, with dill, had a rugged yet succulent texture; they were nothing short of delicious. Good taramasalata too, prominently fish flavoured. A drizzling of olive oil and a sprinkling of pumpkin seeds added more flavour. For main courses, my friend had chosen the skewered miso chicken, chargrilled by the looks of things, delicately spiced and tender. Tremendous value at £8 for 3 chunky skewers. The accompanying kaleslaw was fresh and vibrant, its robustness a welcome contrast alongside the softer meat. A side dish of crunchy pesto coated broccoli with crispy shallots worked well also. The traditional components and colours associated with lettuce, tomato and mustard were nowhere to be seen on my truffle and brisket burger. This nascent devil had an almost monochromatic feel and I’d never seen anything quite like it before. Let’s be clear though and get to the point, after a couple of messy mouthfuls the sheer awesomeness of this burger should not be doubted. This was ‘bad meaning good’ personified. 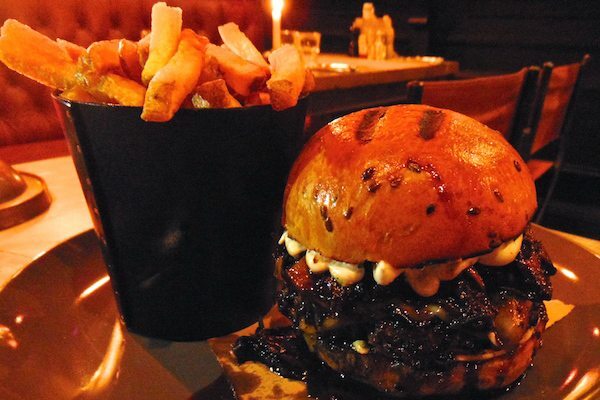 There’s a well seasoned and flavoursome cheeseburger present, but the star turn here belongs to the serving of sticky slow cooked brisket sitting on top, braised for 12 hours in a dark Scottish beer called Engine Oil with chestnut mushrooms. There’s chopped truffle in there as well and some truffle oil worked through the mayo. Decadent without question but it works brilliantly and the truffle does not overpower. The brioche bun I might add, from Brighton patissier Julien Plumart also scored top marks. A feather light treat. Good skin on fries to accompany also merit mentioning. To finish, there are small or big puddings to choose from, a nice touch. We opted for two from the small list. There were profiteroles filled with a light vanilla ice cream in a smooth caramel sauce, while my friend had a toasted marshmallow with peanut butter on a short biscuit base. Like much of the food before, unfussy yet packed with flavour. 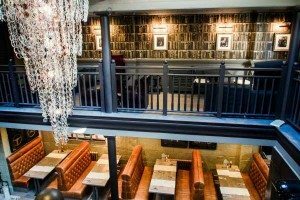 While it may seem like a gregarious menu; there are snacks, bites, pancakes, platters to share, burgers, lobster, chicken, steaks, Sunday Roasts and more, what this menu really offers is total flexibility for the diner, catering for all eventualities. A pit stop for the hungry shopper, brunch / lunch with friends or tailored to deliver a three course meal, it can be done. Whatever the outcome, this is an easy going dining experience for sure but one with no shortage of flavour or refinement from a chef, his brigade and service team who clearly know what they’re doing.